I love how social media can make amazing things happen. No sooner had I favourited, retweeted and replied than I was in touch with James by email and plans were made for me to come and cook breakfast on the shovel of Salmon the steam train. @foodiequine @jameswestabz if you really do, then let's organise a date. The Royal Deeside Railway is a standard gauge steam and diesel hauled heritage railway. It runs from Milton of Crathes Station for about a mile alongside the River Dee. 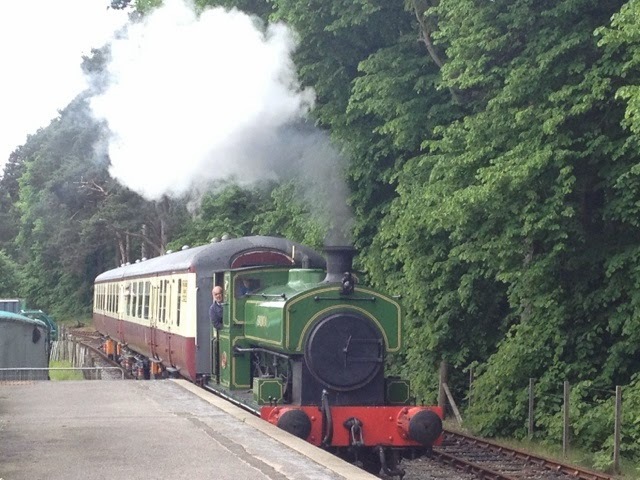 The railway is operated on a 100% voluntary basis with no paid members of staff. 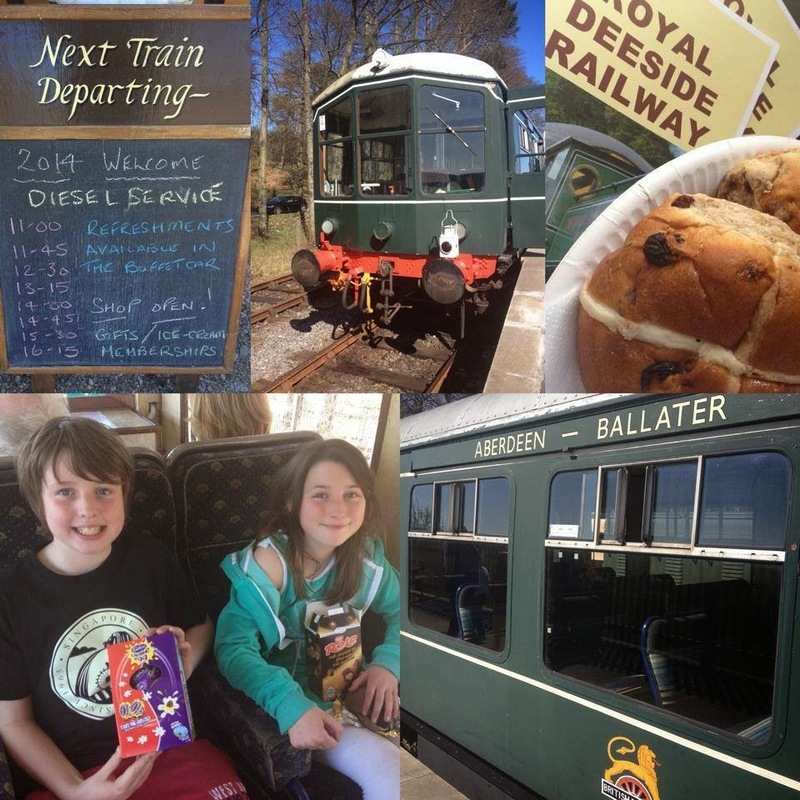 We'd visited for a trip on a diesel service on Easter Sunday, complete with hot cross buns and chocolate eggs, and had promised boy and girl that we would come back again when a steam train was timetabled. At that point I had no idea that our next trip would include a very special breakfast. I guess I've always had some sort of interest in railways and steam. 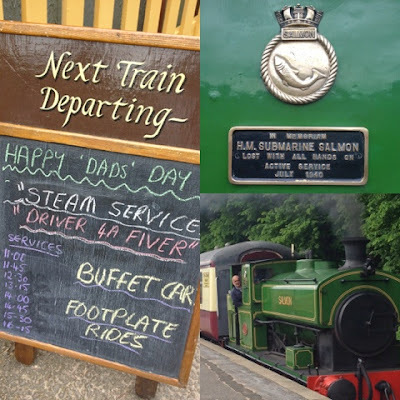 My Dad is a vintage tractor, stationary engine and steam enthusiast and as a child I was dragged to Beamish Museum and the Steam Engine Rally at Hazelhead Park. There comes a point as a child when it's futile to resist. Steeplejack and Traction Engine aficionado Fred Dibnah soon became a much watched TV show. 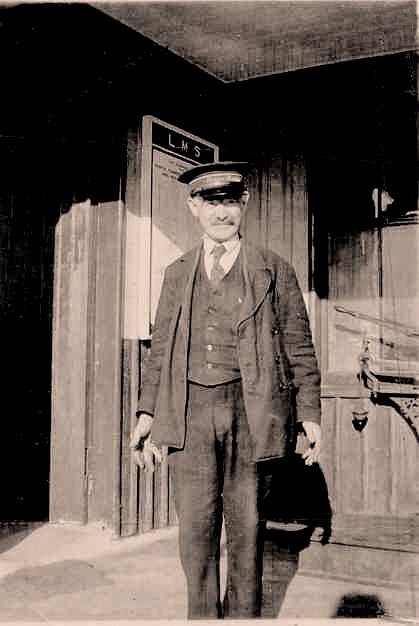 The connection goes back further as my Great Grandfather was Stationmaster and Postmaster at Redcastle Station on the Black Isle Line between 1913 and 1943. 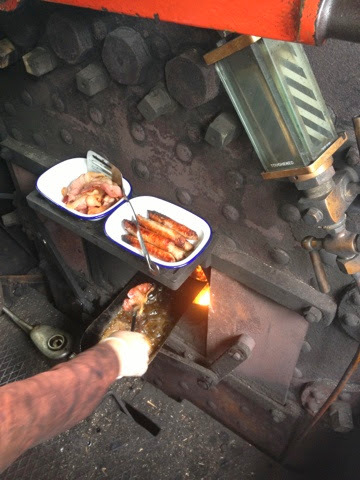 Cooking breakfast on the footplate surely required some quality produce. I headed to Sunnyside Farm for some duck eggs, sausages and bacon. I'd also been visiting Elizabeth at Capability Brown's in Inverness. She's currently busy making Plum Duffs to sell at the Good Food show and when she said they were good fried up as part of a cooked breakfast I knew exactly what had to be done. With basket of supplies in hand we headed to Milton of Crathes Station. Salmon was all fired up ready and waiting. First surprise was that it's not the actual coal shuffle that gets used for cooking on. There's a nice clean shiny one kept especially for the purpose. The fire needs to die down a bit for cooking so we were breakfasting before the first train of the day departed at 11am. 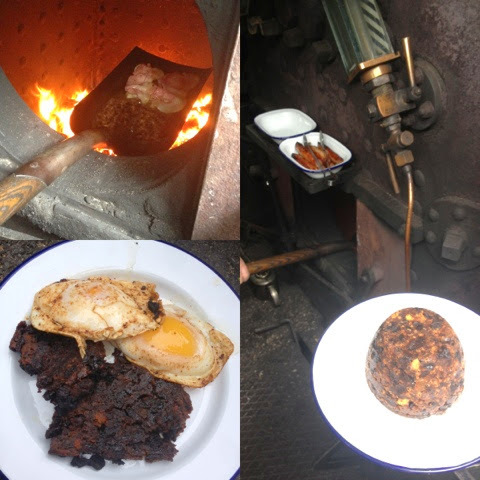 It was still pretty hot on the footplate and even hotter in the firebox. Plenty of oil on the shovel and on with the sausages. 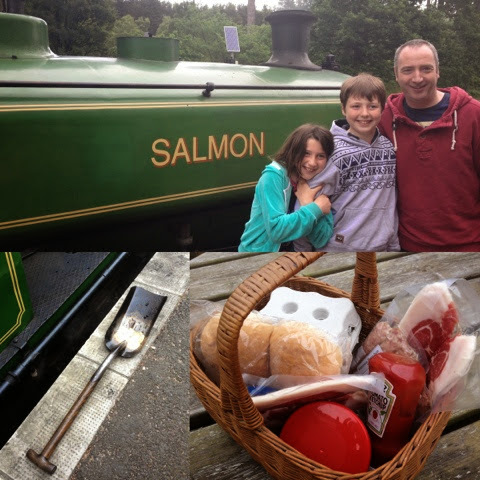 No low fat cooking on a steam train. The most important technique is keeping the shovel level and not letting it tip too much forward or down. 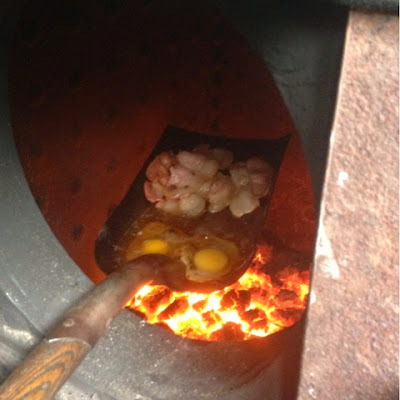 This could result in the oil catching alight or even worse your breakfast disappearing into the flames. 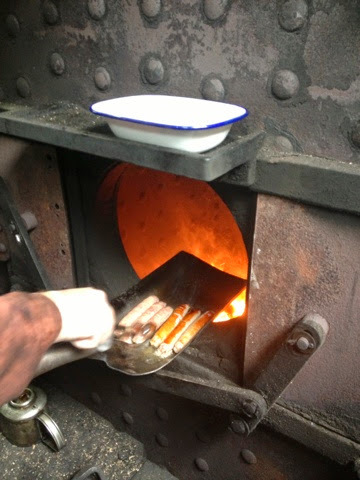 Enamel dishes were warming awaiting the cooked sausages whilst we moved on to bacon and slices of plum duff. 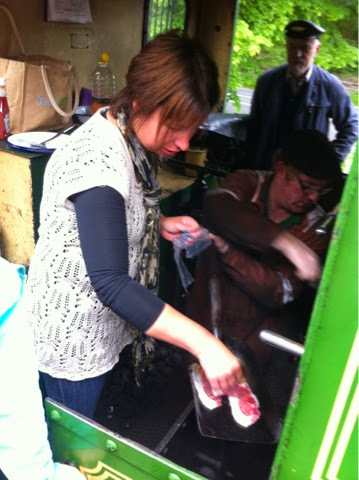 Great smells wafting by this point as the railway volunteers began to lurk in the hope of a spare rasher or two. Last to get cooked were the duck eggs. Even more oil before they were cracked into two perfectly sized hollows at the bottom of the shovel which looked like they were made exactly for the purpose. As for the eggshells? Straight into the fire. Rolls and red sauce at the ready it was time to serve up. Never has breakfast tasted so good. The duck eggs were runny in the middle and the bacon uber crispy. Much dripping of yolk down chins and onto the platform. 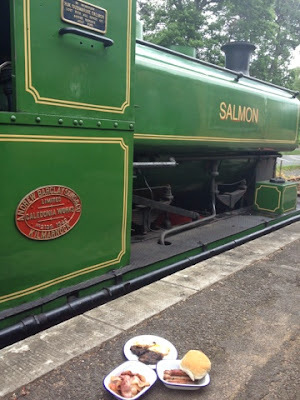 11am was fast approaching so the Fireman fueled Salmon up and we jumped onboard to enjoy a leisurely 20 minute trip to the end of the line and back again. The fun wasn't yet over however as next up was the opportunity to be a 'Driver for a Fiver'. 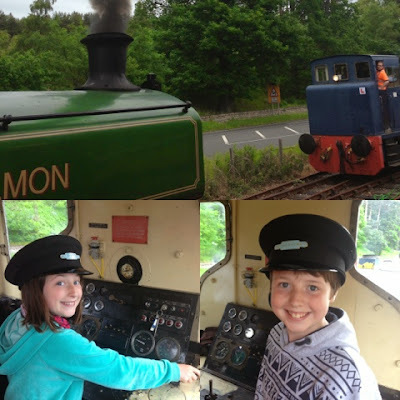 We all jumped at the chance to take control of a vintage diesel locomotive complete with L plates. Fantastic experience. Huge thanks to James West and all the Volunteers at Deeside Railway for having us. This is a tremendous heritage attraction in the heart of Royal Deeside only a short drive from Aberdeen. 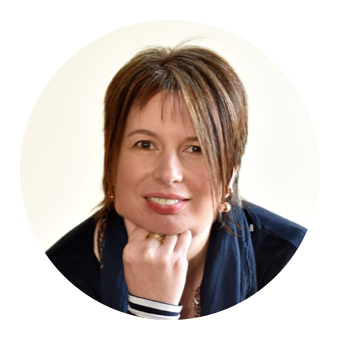 Do visit and support this registered charity which is working hard to preserve, educate and entertain. In addition to a variety of special events throughout the year private charters are available which have included school parties, birthday celebrations and weddings.